Vehicle Wraps are proved to be one of the best forms of advertisement because its visual exposure potential while being dynamic, captivating and very cost effective. Got Wraps? Houston by Xtickers Designs offers a full suite of vehicle graphic solutions. We design and produce Full Color Vehicle Graphics, Vehicle Wraps, Partial Graphics, Vehicle Decals, Vinyl Lettering and Magnet Signs for cars, trucks, vans, busses, trailers, and boats. Got Wraps? Houston by Xtickers Designs also designs, prints and installs Wraps and Graphics for Buildings, Retail Storefront Windows, Restaurants, Billboards signs and even creates custom digital wall paper. We provide one-stop-shop vehicle graphic solution from project initiation to product delivery. If you already have a design, our graphic designers will make sure that it fits your vehicle. if you don’t have a design yet then we will help you select the right graphics, typefaces and colors to create a design that will make you - and your business - look good while meeting your advertising budget and branding strategy. Before handing your project to the production department, we will provide you with a computer rendering showing how your vehicle will look like with the graphics on it. You will be able to make changes and revisions to the artwork. After you're satisfied with the design, we will print and cut your graphics. The process is completed with the installation of the graphics. Our team of professional installers will spend the extra time necessary with your vehicle to reduce seams and create a finished product that you will be proud to show. We understand our customers. We know how hard it is to take time out from their busy schedule to bring their vehicles to our location. That’s why we offer in-house, as well as, on-site installation* in Houston and surrounding cities like Sugar Land, Katy, Pasadena, Galveston and The Woodlands. Got Signs? Houston by Xtickers Designs is committed to providing you with quality vehicle graphics and decals. That's why we only choose from the leading brands in the market. We use premium 3M, Oracal and Avery hi and Medium performance materials that provide the best results lasting 3-7 years on your vehicles. *Not available for vehicle wraps. Vehicle Wraps | Full Color Vehicle Graphics. Turn your truck, car , van, bus or trailer into a moving billboard. 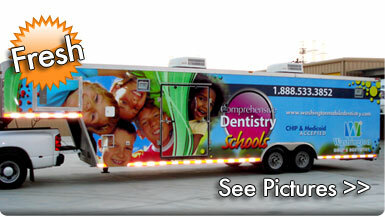 Vehicle graphics are the most cost efficient form of outdoor advertising there is. So, whether you need a full Vehicle Wrap half vehicle wrap or only Full Color Vehicle Graphics for one car or an entire fleet—or even a fleet of boats—call Got Wraps? Houston by Xtickers Designs, and let us put your message in motion. Many of our customers ask us if the vehicle graphics or magnet signs will damage the paint of the vehicle. The truth is that Vinyl graphics can be totally removed without causing any damage to the paint. Vehicle wraps actually protect the vehicle's paint from UV rays while they're on the vehicle. A salesperson will be glad to assist you in finding a solution for your specific need. If you do find an example that is very similar to what you need, please refer your salesperson to that page / image when you call...as it will help us to identify your needs quickly.